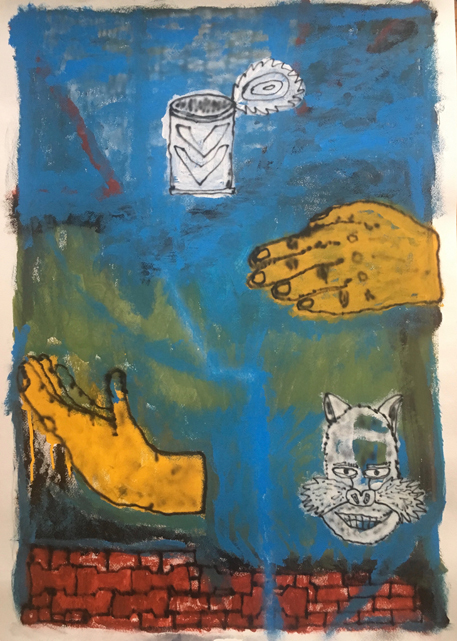 SEASON is proud to present ME AND THE TELEPHONE THAT NEVER RINGS, a show of paintings and mix media drawings by Ilya Okazis (Kaliningrad, Russia) This will be Ilya’s first US show. Opening reception is Sunday April 7, 2-5pm and the show will continue to June 30. Hours are by appointment. Kaliningrad is the administrative center of Kaliningrad Oblast, a Russian enclave between Poland and Lithuania on the Baltic Sea. Kaliningrad was an important port during the Cold War and as such it was closed to foreign visitors. 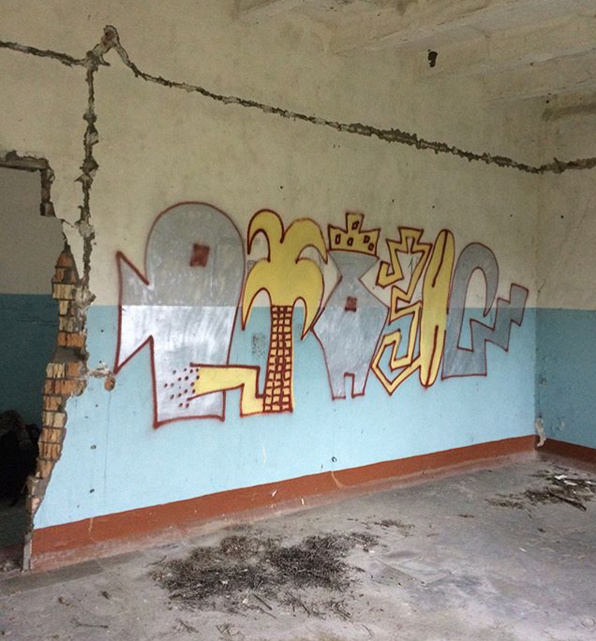 Isolation and introspection are recurring themes in Ilya’s work, many characters have come from his large scale graffiti paintings which are often wildstyle personifications of his last name. He began painting in 2007 and is entirely self-taught. When he’s not painting or riding his bicycle, Ilya plays drums in garage punk bands. Please help me welcome these paintings to Seattle. Constellation, 2019, acrylic and mixed media on canvas, 31.3 x 27.5 inches. 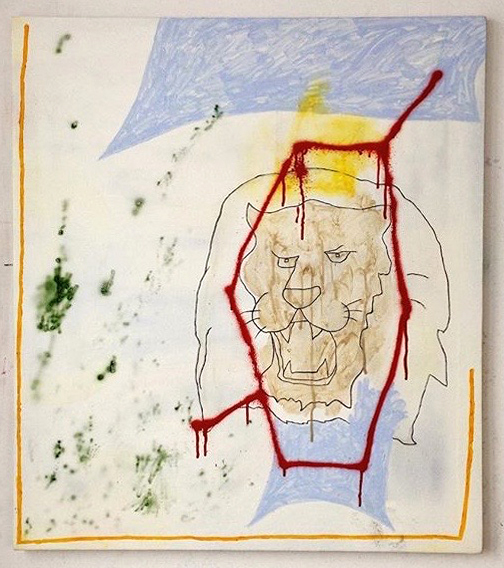 Tom Cat, 2018, acrylic, graphite, and spray paint on paper, 34 x 24 inches. 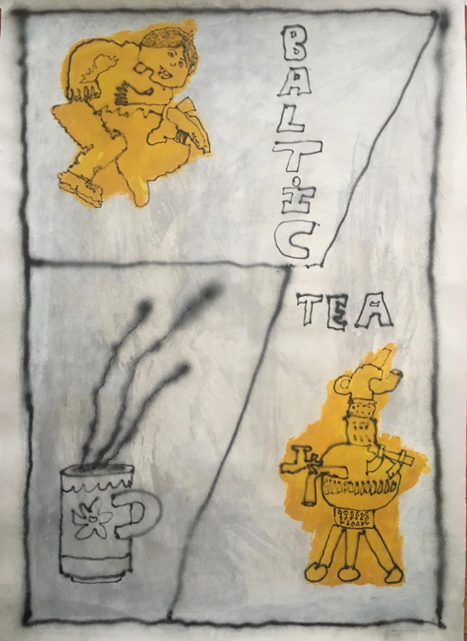 Baltic Tea, 2018, acrylic, graphite, and spray paint on paper, 34 x 24 inches. 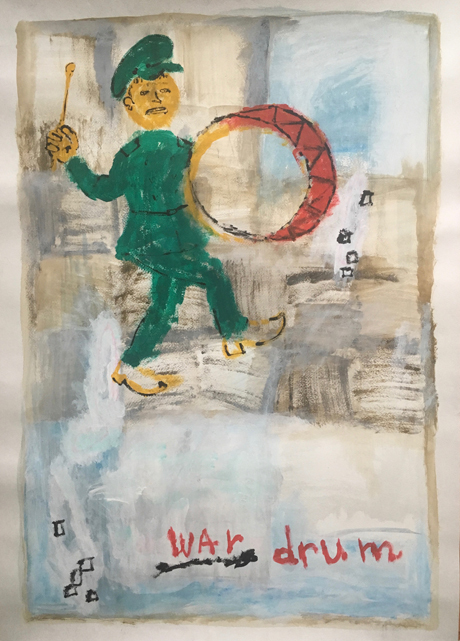 War Drum, 2018, acrylic, graphite, and spray paint on paper, 34 x 24 inches. 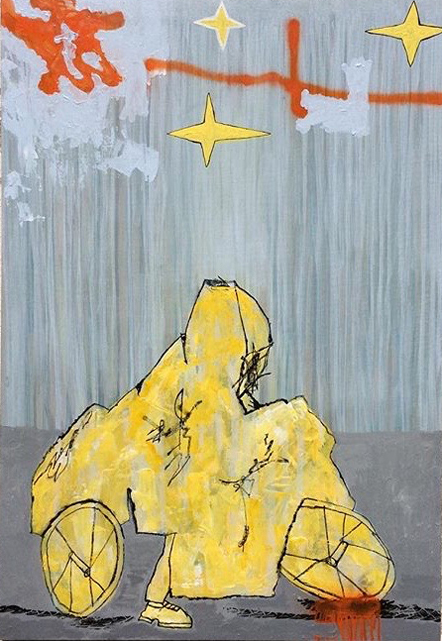 Ilya Okazis, Raincoat, 2018, acrylic and mixed media on canvas, 39 x 27.5 inches. SEASON is proud to present PEACE & PRODUCTIVITY with paintings and drawings by Dubai artist Rami Farook. This will be Rami’s first gallery show in the United States. Opening reception is Sunday, January 13, 2019, 2-5pm. The show continues to March 31, hours are by appointment. My first introduction to Rami was in Miami in a space filled with artists and curators and children all enjoying artwork, making new work, and trading ideas and images. Within minutes of meeting him, he was offering paintings and making introductions and giving away art. It was an exhilarating experience to be surrounded by so much openheartedness and soon I realized generosity was a recurring theme in his work, along with intention, innovation, unity and balance. His paintings are often emotional and impulsive with scattered images and writings across the canvas, Locked in with traditional framing devices. these words (in Arabic and English) show an unending and meandering train of thought as it is captured. The generosity and humility exhibited in these paintings are a complete extension of Rami Farook’s personality. His first design firm, Traffic, quickly became one of the United Arab Emirate’s most popular design galleries which would often host art shows, initiate product launches, and provide film screenings. In 2009, Traffic designed and created all of the visual communication, branding, and industrial design for the UAE’s first pavilion at the Venice Biennale. Also that year he received the British Council’s Young Design Entrepreneur of the Year, and in 2011, he began a studio setup that has since exhibited over one hundred artists. 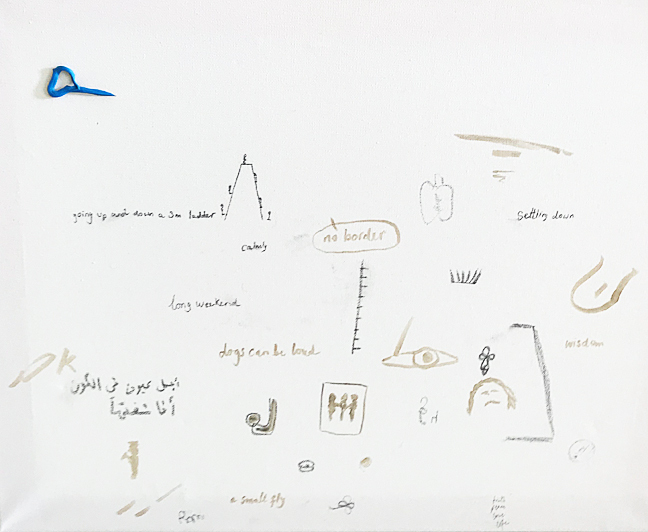 Rami is self educated and has exhibited across the Middle East with inclusion in the Sharjah Biennial at the Sursock Museum in Beirut, curated by Reem Fadda (2017), the Kochi Biennale (2012 and 2014) and the Berlin Biennale (2010). Please help me welcome this artwork to the United States and return the generosity to Rami Farook. Rami Farook, Peace and Productivity, 2019, acrylic and permanent marker on unstretched canvas, 40 x 60 inches. 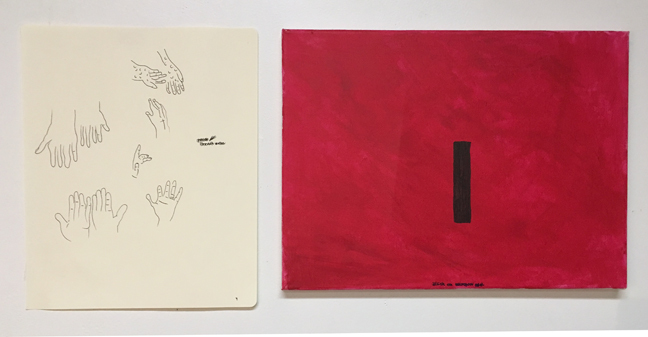 Rami Farook, (l) Untitled, 2018, ink on paper, 13 x 10.5 inches, (r) Black on Crimson Red, 2018, acrylic on canvas, 12 x 16 inches. Rami Farook, Untitled, 2018, watercolor, acrylic and permanent Marker on unstretched canvas, 18 x 22 inches. SEASON is proud to present a solo exhibition of work by Anthony Palocci Jr at EXCHANGE BERLIN, an international exposition of artist/curator-led presentations organized by Sluice, London, around ideas of transnational localism. This expo will take place at KühlhausBerlin, Luckenwalder Strasse 3, 10963 Berlin, November 16-18, 2018.
eXCHANGE BERLIN encourages integrated, collaborative and even spontaneous modes of exhibition and critical evaluation. The aim of all Sluice projects is to offer an independent alternative to the dominant organizational paradigms whilst demonstrating a belief in the importance of international engagement for otherwise local projects. EXCHANGE BERLIN was born from previous manifestations in New York under the title Exchange Rates. The expo’s first iteration was in October 2014 in Bushwick, Brooklyn. A second Exchange Rates took place in October 2016, again in Bushwick. The EXCHANGE exhibitions now travel to a new city every two years. In addition to the EXCHANGE project, Sluice is also responsible for the London based Sluice Biennial and the international Sluice magazine. for each EXCHANGE project, Sluice partners with an organization from the host city, for EXCHANGE BERLIN Sluice has partnered with The Institut für Alles Mögliche, an artistic project that sets about questioning, scrutinizing and probing the institutionalization and presentation of contemporary art. These mostly playful experiments deal with interrogations of the ‘art space’, the operations of the ‘project space’ and ideas surrounding the ‘exhibition’. The central concept for both Sluice and The Institut für Alles Mögliche is to develop spaces of possibility in which exchange and experiences can take place and space where artistic activity can come in to being. Anthony Palocci Jr., Untitled (Pencil Stub) 2018, gouache on paper, 11 x 14 inches. SEASON is proud to present Liquid Crystal, a solo show of recent paintings by Anthony Palocci Jr. The opening reception is Sunday October 14, 2-5pm and the show continues to December 31, 2018. Hours are by appointment only. 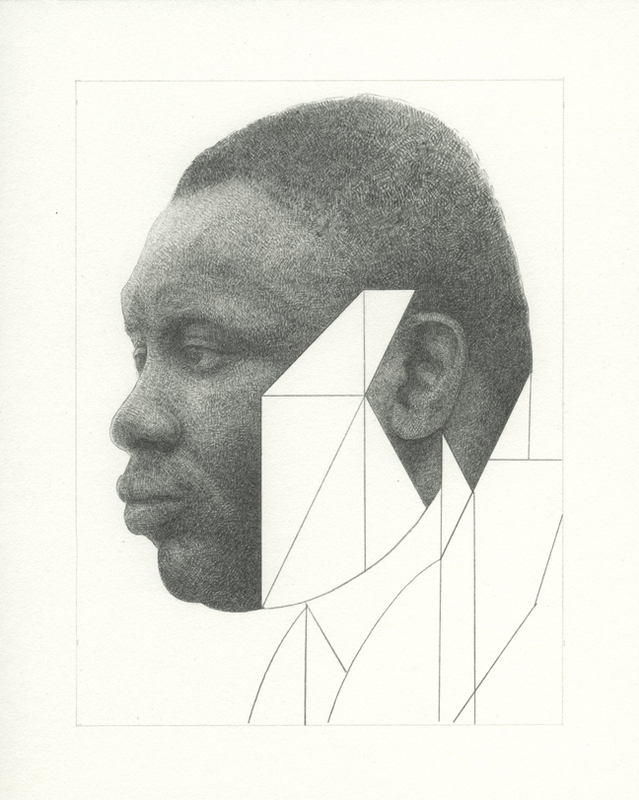 Anthony RECEIVEd his MFA from Pratt Institute, Brooklyn New York in 2012 with a concentration in painting and drawing. 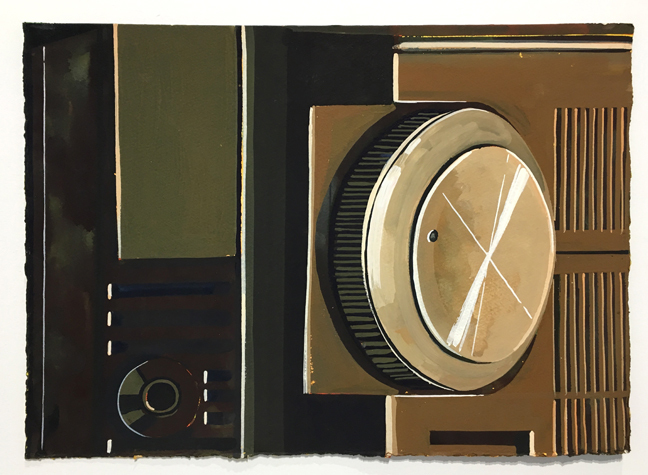 Since graduation, he has shown in many group and solo shows including Boston Center for the Arts; de Cordova Sculpture Park and Museum, Lincoln, MAssachusetts; Galerie Eigenheim, WEIMAR, Germany; Regina Rex, New York, New York; and Good Work Gallery, Brooklyn, New York. 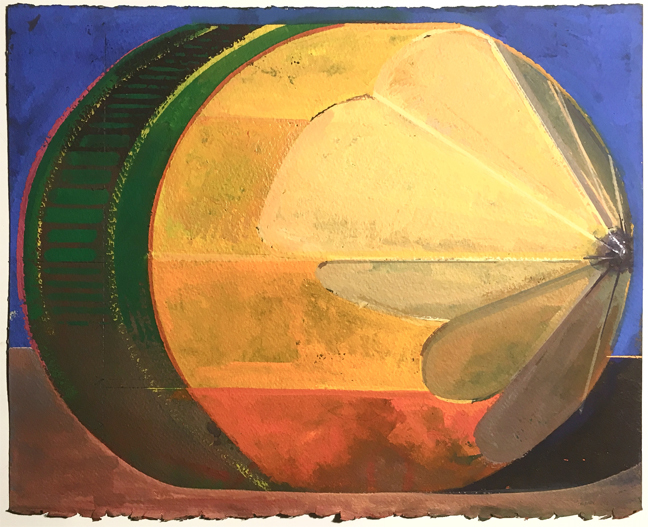 Anthony lives in Boston and is an educator at Massachusetts College of Art and Design with past teaching positions at Montserrat College and Pratt Institute. This will be Anthony’s first solo show with the gallery. 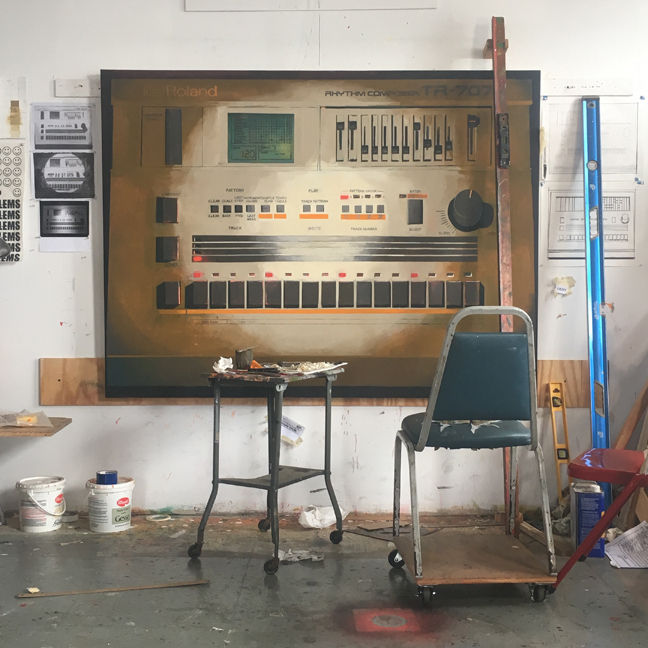 Studio view with Italian Tears in progress, 2018. Anthony Palocci Jr., Italian Tears, 2018, oil on canvas, 54 x 72 inches. 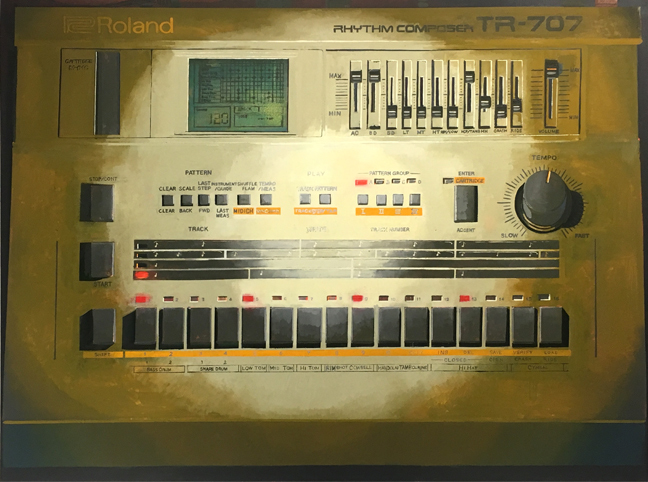 Anthony Palocci Jr., Yamaha MultiTrack, 2017, gouache on paper, 15 x 19 inches. 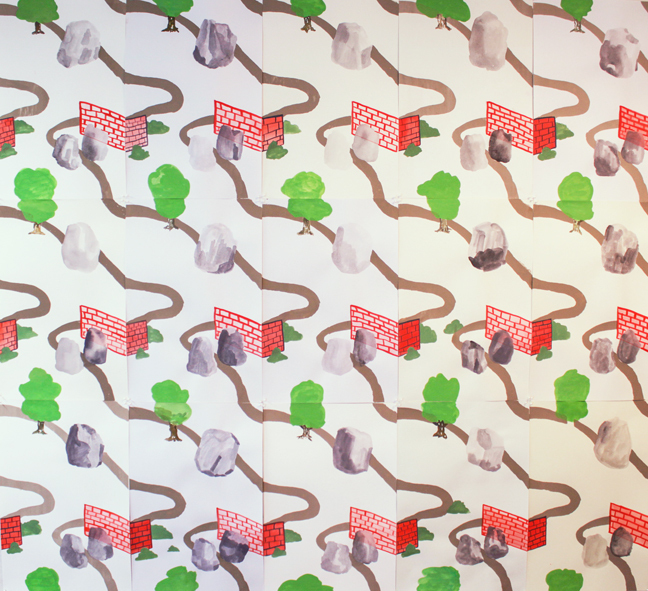 Anthony Palocci Jr., Cleanse, Fold, and Manipulate, 2016, gouache on paper in two parts, 24 x 12 inches each. 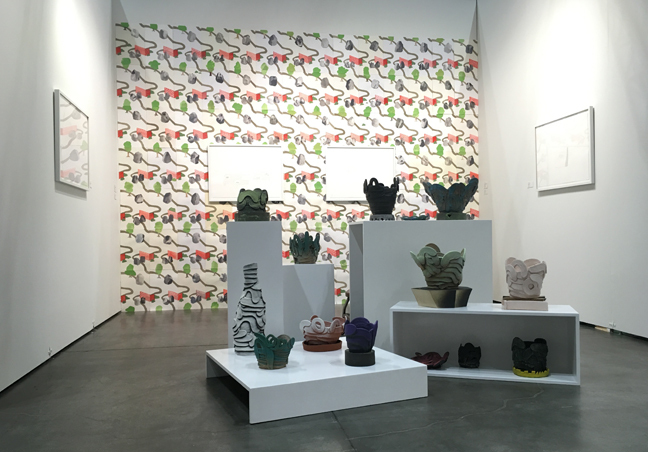 SEASON IS PROUD TO PRESENT A BOOTH PRESENTATION OF new work by three seattle artists, Luke Armitstead, Dawn Cerny, and Sean Pearson AT Seattle ART FAIR, Century Link Exhibition Center. 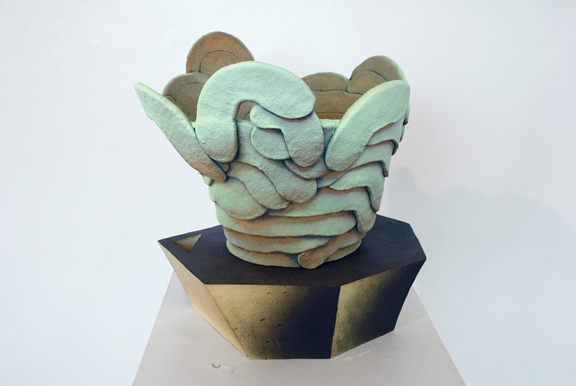 Luke Armitstead, Mint Bauhaus Noir, 2017, glazed earthenware with acrylic, 12″ wide x 18″ high. Dawn Cerny, There Is No Rhyme. There Is No Nursery. There Is No Moon, 2018, hand painted gouach on silkscreen on assorted archival papers, 18 x 12 each, unique edition of 130. 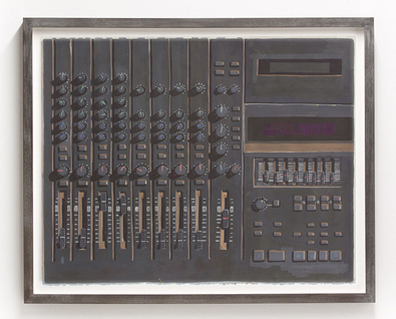 SEASON is excited to present a solo show of Los Angeles artist Ryan McIntosh. Opening reception is Sunday April 22, 2-5 pm and will continue to June 30. Ryan McIntosh is an artist living and working in Los Angeles, California. He received his MFA in Printmaking from Rhode Island School of Design, and his BFA in Photography from the University of Arizona. 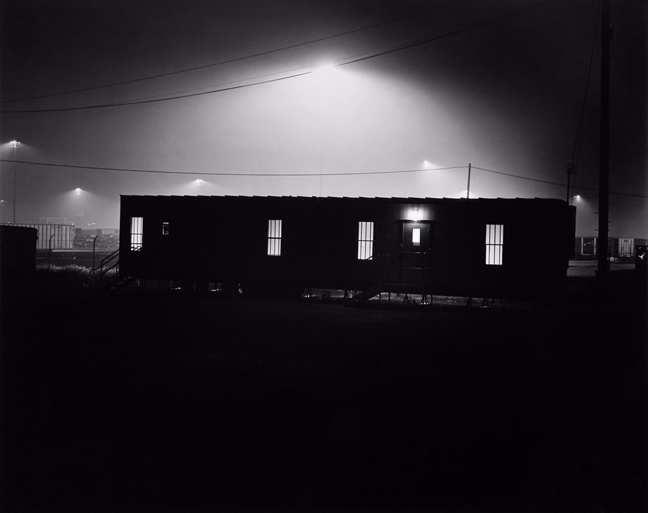 In 2007, he felt heavy limitations on what one could artistically express with the camera and so he quit working in the medium of traditional B&W darkroom-based photography. His artistic interests were towards other means of expression such as painting, printmaking, and collaborating with other artists. Last year Ryan broke a ten year hiatus away from creating photography. This new body of work, made exclusively with a 70 year old 8×10 Kodak view camera and a preferred old stock of long-discontinued, expired photo paper; allows the process to become purely analog. The immediacy and instant gratification we’ve come to know with photograph today is instantly halted by the process of using such vintage equipment. Working this way is not out of nostalgia or sentiment for the past, but rather his desire to slow down every step of the image making process and forcing himself to spend time studying and composing the subject with equal time crafting the expressive fine print in the darkroom. Photography has always been about documentation of what is in front of the camera. More so however, it is about the artists personal engagement with the world. These new photographs are less about the subject portrayed, and more about the visual experience had in their creation, and the visual experience that’s translated to the viewer in the final print. Print info – All prints are 8”x10” silver chloride contact prints, made directly from the 8×10 negative in a traditional wet darkroom, and printed by the artist. All prints are mounted to a 14×17 matt, signed and dated on the recto, and titled, numbered, signed on verso. Prints are numbered, but not editioned. 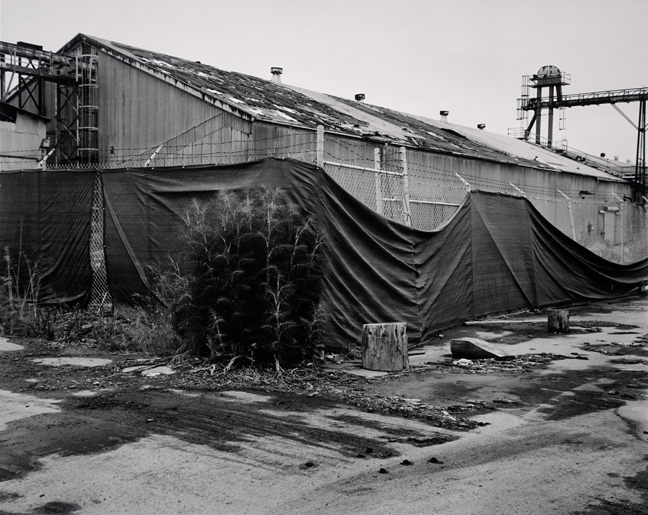 Ryan McIntosh, Richmond California, 2017, silver gelatin print, 8 x 10 inches. 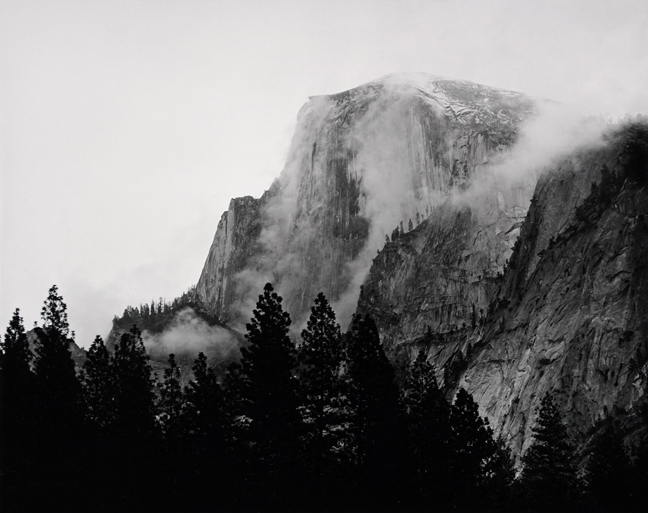 Ryan McIntosh, Half Dome Yosemite California, 2018, silver gelatin print, 8 x 10 inches. Ryan McIntosh, Brian Head Utah, 2018, silver gelatin print, 8 x 10 inches. Ryan McIntosh, Weeping Rock Zion National Park Utah, 2018, silver gelatin print, 8 x 10 inches. Ryan McIntosh, Los Angeles California, 2017, silver gelatin print, 8 x 10 inches. 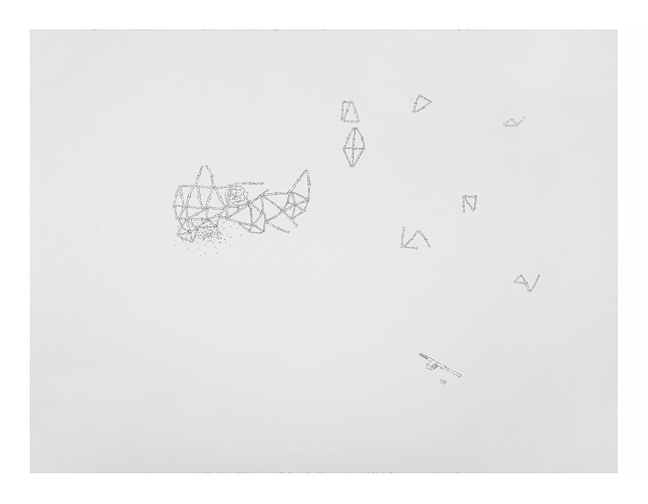 SEASON is proud to present Heavenly Nightly with new assemblages and constructions by New York artist Nicola Ginzel. 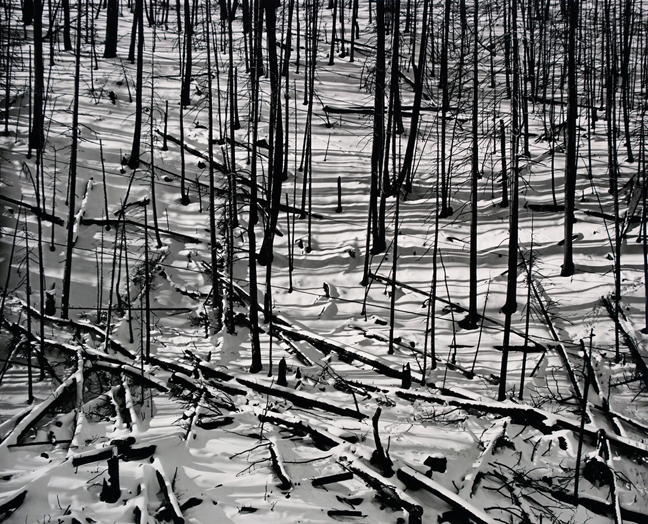 The opening reception will be Sunday January 14, 2-5 and the show will continue to March 31, hours are by appointment. I’m trying to remember that little tin box you always had on you; it was tiny and hinged and you kept weird stuff from your grandparents in it. An old newspaper clipping and a broken bracelet and something else I guess. It all probably meant more to you than I ever considered. I look deeper for that kind of inner beauty but often struggle. You always find it; it’s there, you know it and it’s effortless for you to see. 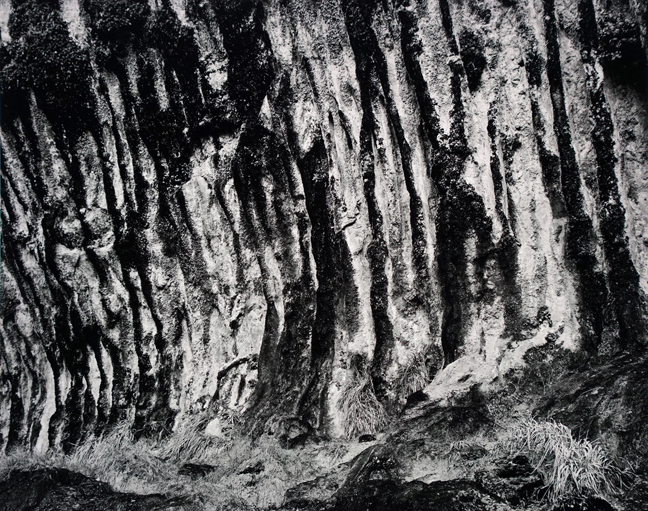 Nicola Ginzel has received grants from the Mayer Foundation, Max’s Kansas City Project, and Artists’ Fellowship Inc.. Residencies include SIM—The Icelandic Visual Arts Association and Reykjavik Art Museum Residency; The Skaftfell Cultural Center Residency in Seydisfjördur, Iceland; and BoxoPROJECTS in Joshua Tree, CA. She had her first ten–year retrospective and traveling museum exhibition “Language, Symbol, Artifact” at the Tennessee Valley Museum of Art in 2013. Other selected solo exhibitions have been at Heskin Contemporary in NYC; Cathouse FUNeral in Brooklyn; Jenny Jaskey Gallery in Philadelphia; Corridor Gallery in Reykjavik, Iceland; and The Gallery @ 1GAP curated by SpenceProjects in Brooklyn. 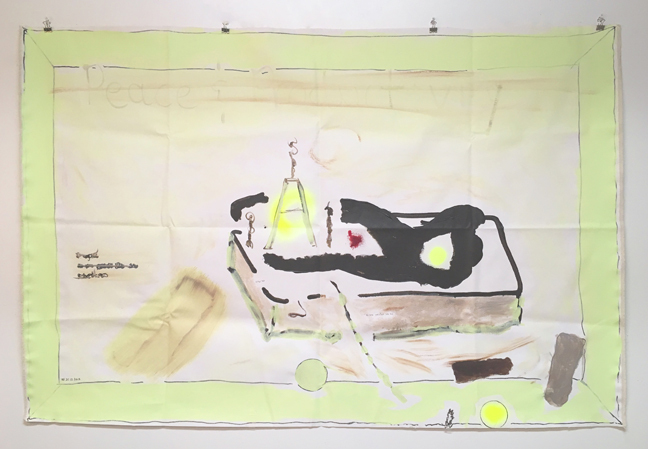 Selected group exhibitions include Bernard Jacobson Gallery, NYC; NARS Foundation, Brooklyn; Centotto in Brooklyn; and Cindy Tower’s curated guerrilla shows at MoMA. 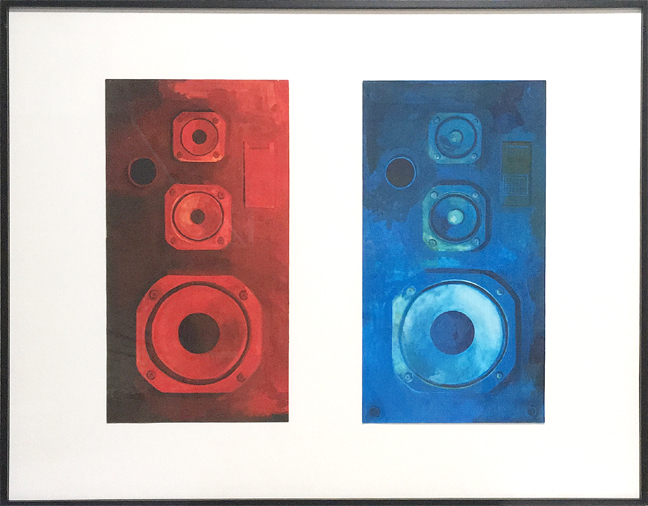 Nicola’s artwork has been featured in Art in America, Artcritical, New Art TV, Time Out New York, The Philadelphia Inquirer and The Chicago Tribune. This is Nicola’s first show at SEASON. 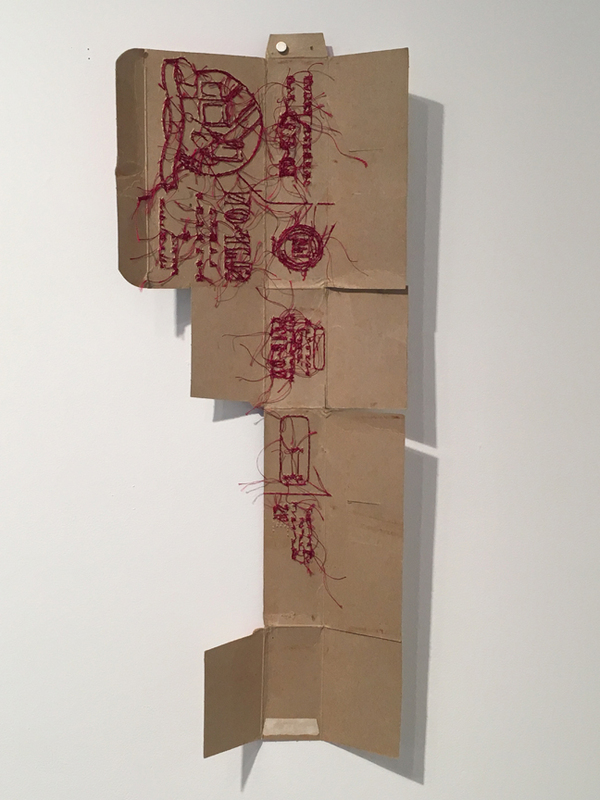 Nicola Ginzel, Backside Fragment, No Slip, 2017, embroidery on cardboard with wax and ink, 18 x 7 inches. 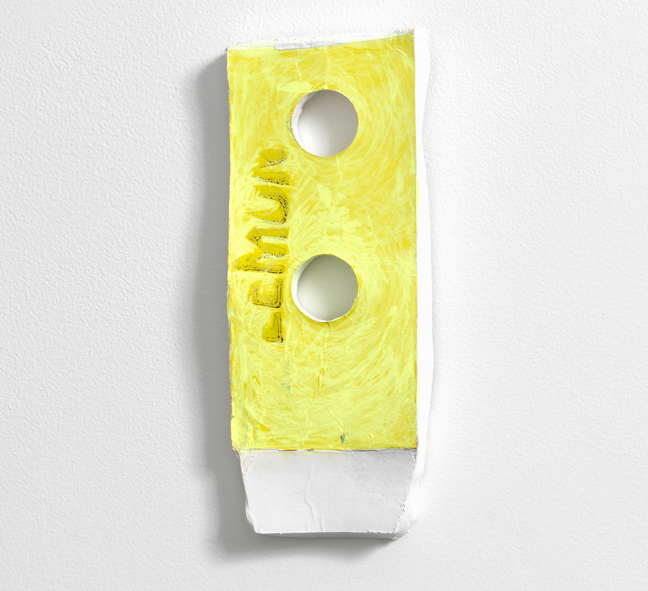 Nicola Ginzel, Composite Fragment, Just Lemon, 2017, cardboard plaster and ink, 7 x 3.5 x .5 inches. Nicola Ginzel, Composite No. 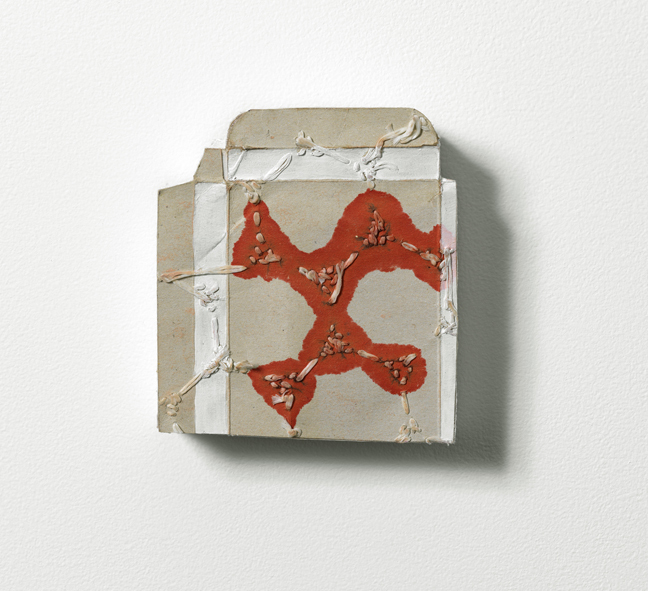 2, Suppen Würfel Umgedreht, 2007-17, embroidery on cardboard with ink, 5 x 4.5 x 1 inches.